CNG: eAuction 366. ISLAMIC, Mongols. Great Khans. temp. Töregene Khatun. Regent, AH 639-644 / AD 1241-1246. AR Dirham (19mm, 2.70 g, 12h). Wartan(?) mint. 366, Lot: 992. Estimate $300. ISLAMIC, Mongols. Great Khans. temp. Töregene Khatun. Regent, AH 639-644 / AD 1241-1246. 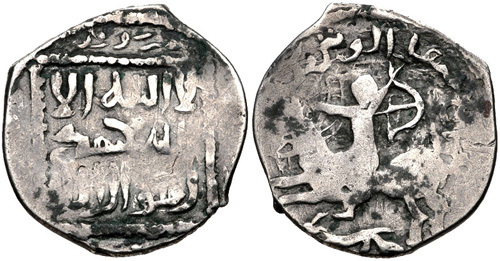 AR Dirham (19mm, 2.70 g, 12h). Wartan(?) mint. Shahada in three lines; mint formula and AH date around / Archer turned right on horse left; hound below. Cf. Vardanyan, Some, 21 (for type) cf. Nyamaa 11 (same); Album 1976. VF, areas of toning and flat strike.